Posted on 23 December 2011. Is the Premier abandoning his own national and executive selection? 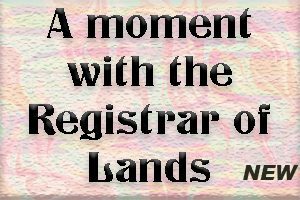 It has been for several years this topic about a Montserrat National Song has surfaced time and time again. Very often at functions when the singing of an anthem seems appropriate and it is obvious that the organisers, be they from within the official walls of government or otherwise, the British National anthem would be overlooked, and in its place the program would show ‘A Patriotic Song’. But very rarely would the song be the National song that was for whatever reason has been undecorated since 1995 after being selected and approved. Now the topic has surfaced again and at the possible highest level where the Hon. Premier Meade while in the UK attending the OTCC meetings in late November, was enlisting the support of the Montserrat Diaspora with the creation of national awards and symbols. This week just before going to press Wednesday, Dec. 21, the matter was again raised at the Diaspora Conference, which as this was written was taking place at the Cultural Centre. Just around that time while he was recently in London, the Premier should have received or about to receive an email from the writer of a national song which bears the title, “Montserrat My Country” by Denzil Edgecombe. This song was selected by committee set up by the NPP government of 1991-96 under the leadership of this now Premier, then Chief Minister Reuben T. Meade. 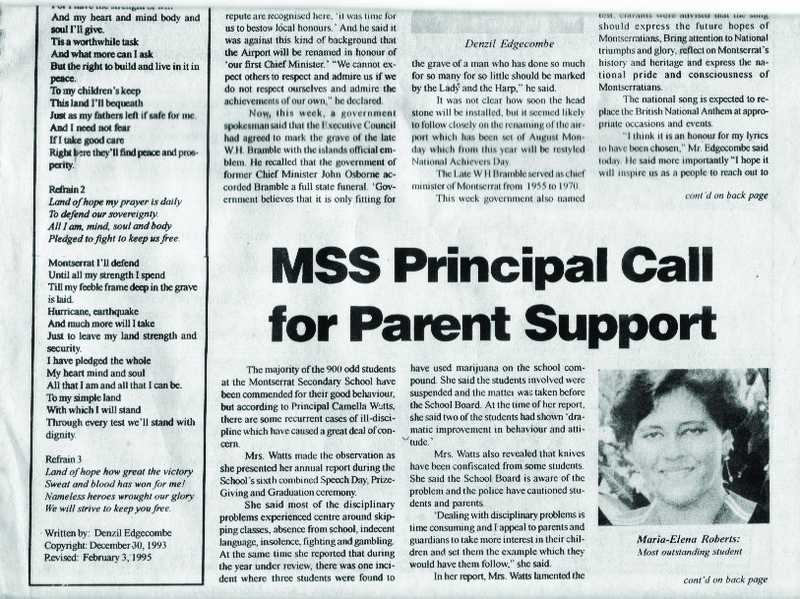 Shown here are Montserrat Reporter newspaper clippings from 30th June, 1995 which were just days before the volcano showed itself changing Montserrat life, since. 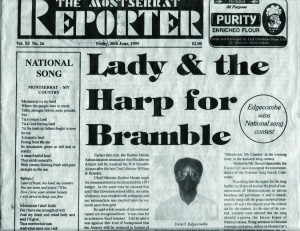 The clippings are to be combined and read as one under the front paged caption ‘Lady & the Harp for Bramble’ and in the circle ‘Edgecombe wins National song contest’. It will be seen that in that article the announcement where the “‘National Day Committee’ is seeking nominations for the Montserrat Order of Excellence Award”. Mr. Joseph Daniel, who today is residing in the US Virgin Islands and heading an energy department there, was the chairman of the committee and in 1995 said that every Montserratian would be considered for the award in every sphere of human activity. Nominations were to close on July 14, 1995 and awards announced on National Achievement Day, August 7, 1995. 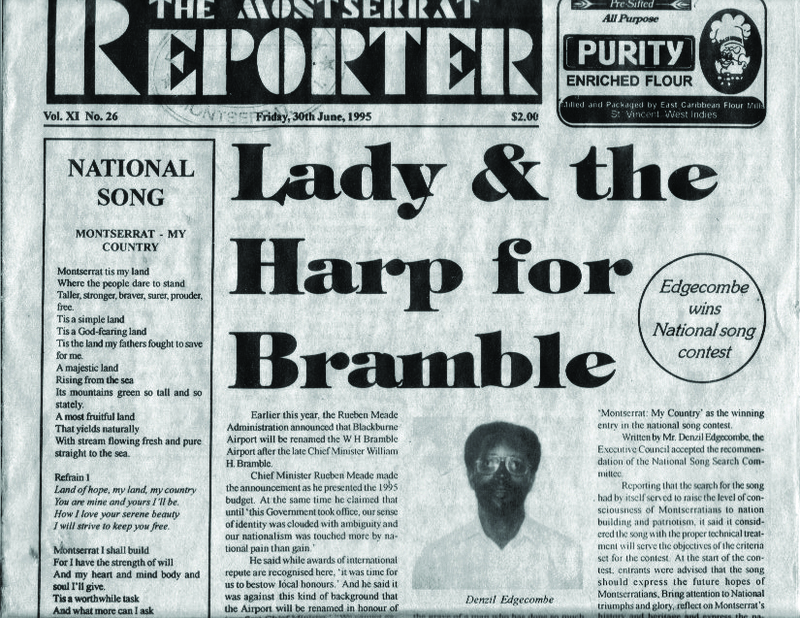 After recalling some of what transpired since the song was chosen, Edgecombe concluded his letter, referencing the article referred to above: (see a front page clipping Montserrat Reporter Vol. X1 No. 26 published Friday, 30th June, 1995). He wrote, “I really was dismayed and disappointed to hear you declare that we don’t. I cannot think of any reason why one would seek to take away the honor bestowed on me personally when my song was chosen as the national song of Montserrat apart from that of bias, which is a trait you would not wish to encourage in our people. Furthermore, it is an unconscionable act to begin a process of nation building and fostering national symbols by committing such a flagrant violation to our chosen national song. This act will be on record throughout history, and as more people become aware of it, the issue will continue to divide the nation. That song was performed only recently by the Lookout School at their annual concert held at the Cultural Centre.